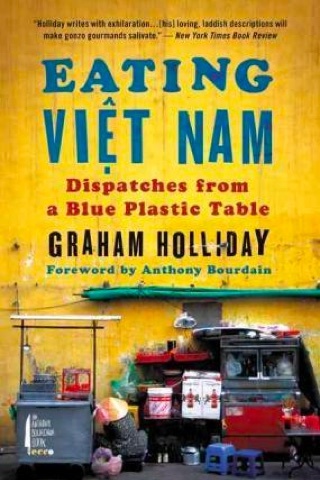 Eating Viet Nam: Dispatches from a Blue Plastic Table is a memoir of avid street-food-diner-turned-blogger Graham Holliday. It’s not a guide to Vietnamese cuisine or where to eat — though the more enthusiastic reader might take some notes and be well rewarded — but rather it’s a bit of a potted history of street food in both Hanoi and Saigon, from when it reappeared during the “doi moi” or economic renovation period of the late 1990s, and into the 2000s. Holliday meets his wife-to-be when he tries to sell her his Minsk when departing Hanoi for South Korea (he’s back quick smart — she never paid him for it, either); he introduces his son to street food as soon as he’s eating, too. He paints a picture of a culture that now seems in danger, and imparts a sense of fear for the future of Vietnamese street food. Not only has a generational shift occurred, as younger Vietnamese tend to not be the universal kitchen whizzes that their parents were, but authorities with an eye on futuristic Singapore have been gradually tightening various bylaws and edicts relating to street food vendors, making it ever tougher for them to operate. On the other hand, the overall number of vendors is reportedly growing. Holliday’s conclusion? “As the travel books say, go now. You know, before it’s too late.” Maybe grab those tickets and pack your appetite while you can.